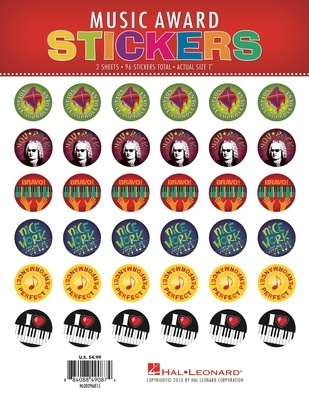 All music students will love being rewarded for their achievements with these cool new stickers! Words of encouragement include: Notable Improvement, You Rock, Bravo!, Nice Work, Perfect Performance, I Love Piano, A+and Beautiful. Each package includes a total of 96 full-color stickers - 12 stickers of 8 different designs.